Capital One "Worn Jeans" by DDB Chicago. Banks and credit card companies face an unsettled future as Apple Pay, the mobile payment system that runs on the iPhone 6 and the forthcoming Apple Watch, joins new wave of ways to spend and borrow money. PayPal and Square were early players — now joined by Google Wallet and next-gen lenders like the Lending Club. Fueling the trend are Millennials who grew up with the 2008 financial meltdown and are wary of the banking conglomerates on which their parents depended. "Consumers’ comfort with handling their finances via technology is steadily rising, and they are less inclined to have single bank relationships in exchange for ‘best of’ products and services from a variety of providers," said Binna Kim, Managing Director of Cognito, New York, a marketing and PR firm specializing in financial services. These days, more customers take a DIY approach – with multiple banks accounts, credit card providers, and lenders, she said. Individual financial brands risk taking the back seat to a seamless tech brand that helps manage those various accounts. The selling of Apple Pay is at the center of the culture shift. To use Apple Pay, you register your debit and credit cards in your iPhone by photographing the cards with your phone. Apple verifies them, and then you can pay by waving your phone at the check stand. Apple is working to get more stores to install the technology needed for these mobile payments. So far, about 750 banks and credit firms support Apple Pay, which launched in October 2014. At Whole Foods, mobile payments increased more than fourfold since the stores started accepting Apple Pay. At Panera Bread cafes, 80% of mobile payments are made with the Apple system, said Apple CEO Tim Cook in a Jan. 27 earnings call. Credit card companies have been quick to promote Apple Pay over the past four months, with varying degrees of awareness of the shift it represents. 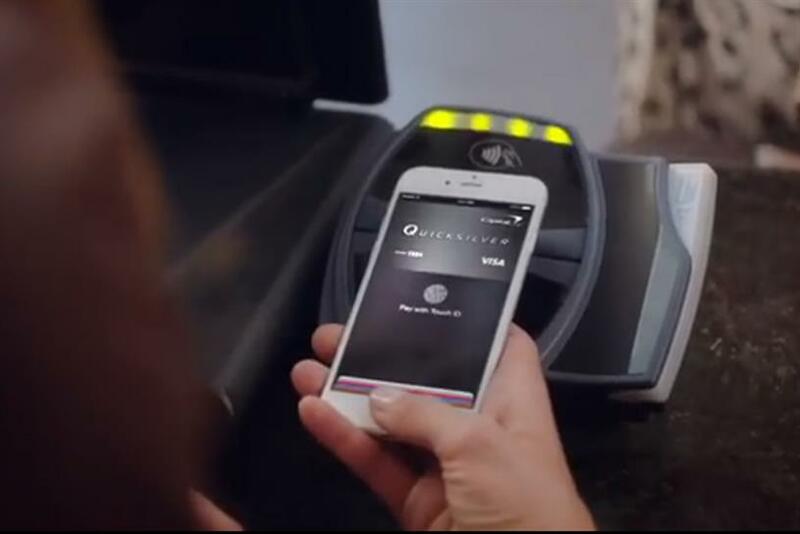 Capital One is running a TV ad that demonstrates the way Apple Pay is used at retailers and stressing the convenience compared with traditional payments. With a nod to younger consumers, the spot by DDB Chicago shows people buying items by pulling their iPhones out of jeans pockets imprinted with the phone’s shape. "Your phone is your new wallet," it states. Bank of America’s ad also acknowledges the change in what customers want from financial companies. Showing an upscale woman shopping for her family, the voiceover calls Apple Pay, "The new, easy, secure, smart way to pay with a simple touch. That's the convenience of innovative connections." MasterCard, in contrast, takes a traditional rewards approach. In its ad by McCann Erickson, singer Gwen Stefani fires gifts from a cannon to MasterCard customers who use Apple Pay. The message is backed by a promotion that hands out unexpected real-world prizes to selected cardholders. Chase also goes the celebrity route. Its TV ad shows indie band Bleachers wandering through Los Angles making purchases with Apple Pay using their Chase credit card. To keep up with customer expectations, financial brands have to do more than market the latest tech trends, Kim said. "One of the biggest frustrations in the industry is that the user experience is fragmented" and far from seamless. The mix of options open to customers is broader now for financial brands, concurred A. Dawn Lesh, adjunct professor of marketing at New York University. "Apple is doing a great job of branding some of the technology that banks already had, and now it’s up to the financial marketers to make that a new part of their business."